In 1946, four representatives from the RSA approached the Shannon Borough Council to ask that it give a lead to arising a public meeting at which four proposals were submitted for consideration, one them was a Memorial Hall. The Hall project was carried by seventeen votes and an elected Committee: R.R. Lind (chairperson), R. Hook (secretary), J. Sinclair, V.J. (Buster) Bateman and H.D. Aitchison. The decision to build the War Memorial Hall arose because of two quite different needs; the Druids hall was privately owned and therefore not a Community place, and there was a desire to erect a suitable Memorial to those who had lost their lives during the second World War. The District was canvassed for donations and fundraising began which included Queen Carnivals, but it was several years before sufficient money was raised. A section in Grey Street was donated by Mr and Mrs John Roach, a subsidy was obtained from the Government War Memorial Committee, a branch of the International Affairs Department and the Shannon RSA raised almost four hundred pounds in one week. The Shannon War Memorial Hall was built in 1954 by Sayer Bros, the outcome of much fundraising and hours of voluntary labour. The Hall was completed and officially opened in September 1954, with a full week of celebrations. In 1972 tables were donated to the Memorial Hall and the chairs were repaired. A music hall evening was held in the Memorial Hall to fundraise for the play-centre, which led to the formation of the Shannon variety players in 1981. The Memorial Hall was used for shows, and the profits were used to buy lighting equipment, improve the stage facilities and to build up scenery, props, and a substantial wardrobe. Mrs Nickelison said the only change since the Memorial Hall was built is that it got painted. 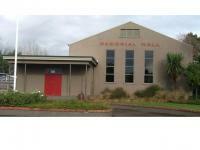 Whae Hui said the hall was used for lots of sports activities. Every week there was sports in the Hall, things like: badminton, basketball, boxing. There was also Ball/prom evenings, and over seventeen dancing. The Hall can be hired out, the Shannon Library holds the key. The Hall gets used for breakfast in schools. The Hall gets used for holiday programs and discos. By Marjorie D. Law: Pages 144, 57, 162, 222. Team effort by Pachience (Year 8) and Shanice (Year 8).